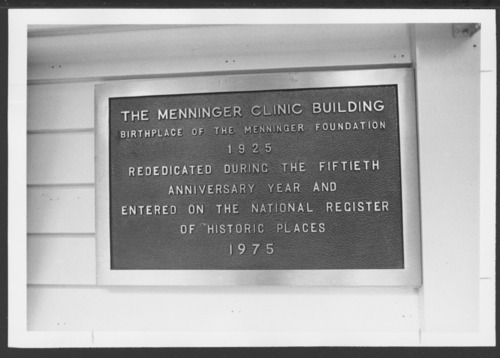 This photograph shows the National Register of Historic Places plaque placed on the original Menninger Clinic building, a farmhouse purchased in 1925 and remodeled to serve for inpatient treatment. The Menningers brought a positive commitment to psychiatry when they opened the doors to their sanitarium in 1925 and admitted its first 13 patients. During the Fiftieth Anniversary celebration, the farm building was rededicated.